Blah blah blah. You see this pretty much every month. Moving on. This came in one of those stupid Bellaboxes with a conditioner that I also used but can't find now. Judging by the RRP for the full size it's a salon brand, though I've never heard of it, and I didn't find it any better than the cheapo Sunsilk I often use. I would not repurchase this. This stuff replaced the daggy old blue one, but I liked the daggy old blue one. This one doesn't seem to do as good a job. I wouldn't say I'd never repurchase it - maybe if I saw it cheap somewhere because eye makeup remover will always get used in our house - but I wouldn't go out of my way for it. My friend Jodi always buys her Clarins skincare when they have a GWP, and they have a lot of GWPs, which are also really good. The one thing she doesn't use is toner, so a while back she sent me 5 of these little half size one that she had collected from various GWPs. I love me a toner, and I love me some Clarins, so I enjoyed this. I don't need to repurchase for quite some time as I still have 3.5 bottles left, but I would buy it again, and I have a couple of times in the past. I don't much rate Benefit - I love their Creaseless Cream eyeshadows, but a lot of their other stuff I've tried I've been pretty meh about. I think it's overpriced and over-rated. I fully expected to feel the same way about this eye cream (which was sent to me by Beauty Heaven), but I LOVED it. It's very light and absorbs easily, and definitely seems to do something to make my fine lines appear (and feel) smoother. I will definitely repurchase this when I've used up the half jar of Youth Code eye cream I'm currently finishing off. Two thumbs up! This thing has been threatening to give up the ghost for about 3 months but kept hanging in there. There's actually still a teeny bit of powder still stuck to the base, but the brush doesn't seem to be picking it up so I'm calling it. I am not a powder fan normally and I only ever use it if I have to, but I freakin' love this - it doesn't feel heavy or cakey and it doesn't look powdery on my face. I will probably buy it again soon but first I have a couple of cheaper alternatives to try out, as I hate paying RRP for MAC in this country. Gouging bastards. 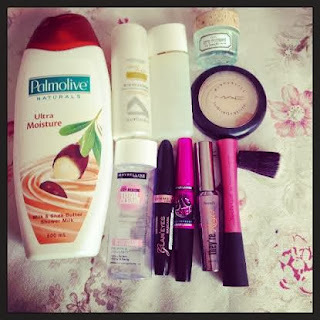 Mascaras: Rimmel Glam'eyes, Maybelline Big Eyes, Benefit They're Real! Until earlier this year I had been pretty good for a couple of years about only opening one mascara at a time. But then I Iwas sent the Benefit one to trial, I saw the Maybelline one in Allure magazine and had to grab one each for Noodles and myself on eBay, and the Rimmel one was on spesh one day at Priceline, and things just kind of snowballed. These are all pretty dead now and I'm back to my one-at-at-time routine (Covergirl Clump Crusher - so far unimpressed). As to whether I'd repurchase, I don't know. I liked the Rimmel one, though I didn't love it. I liked the Benefit one quite a bit at first but it didn't take long for it to go gluggy and clumpy, and it's expensive, so probably not. I didn't like the Maybelline one at all - it was waterproof and a pain in the arse to get off, and it made my lashes clumpy after a while. Yep, I've killed another brush. I don't know how it happened - I am very careful not to use hot water or let them get wet past the bristles. But one day I washed and then squeezed out the water and out came the clump of bristles. The fluffy eye brush that comes in that 5 piece set is looking ready to do the same thing - the bristles feel loose when I wash it. Hmmm. I don't think I'd repurchase this brush if it's that delicate, and I didn't really use it much except for cream blush and highlighters anyway. I went to put this on yesterday afternoon and noticed it smelled a bit funky, so after some comparisons with the smell of other Mega Shines, I decided it's had its day and needs to go. I woudn't repurchase it - it's a nice enough gloss but I hardly ever used it. That Benefit mascara would be the most overrated ever. Conversely, I really loved the CG Clump Crusher. I find the Clump Crusher underwhelming - I barely look like I'm wearing mascara. I WANT SPIDER LASHES, DAMN IT. I have to agree that I don't see what the rage was with clump crusher. It didn't do much of anything to my eyelashes, but a lot of gurus seemed to love it. I didn't even use it more that a few times. Meh. It reminds me a lot of Maybelline Great Lash. Another one I don't get the hype about.